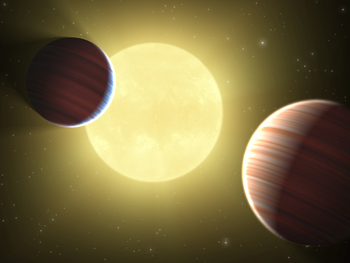 NASA announced today that the Kepler spacecraft, which is controlled by students and professionals in the LASP Mission Operations Center, has discovered the first confirmed planetary system with more than one planet transiting the same star. Kepler is one of several missions currently operated at LASP; students take training to be certified operators with oversight from professionals. For more information about LASP’s role on Kepler, please see http://lasp.colorado.edu/home/missions-projects/quick-facts-kepler/. For more information on the discovery, read the NASA press release at http://www.nasa.gov/mission_pages/kepler/news/two_planet_orbit.html.